P.Tchaikovsky.Variations on a Theme of Rococo. 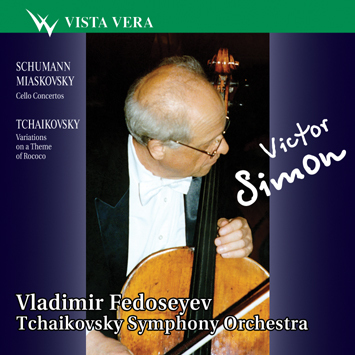 The works on this CD were written between 1850 (Schuman's concerto) and 1944 (Miaskovsky’s concerto) and represent the history of musical romanticism in its peculiar cello aspect. of musical ideas which seem to overcome the barriers between the movements. Schuman's concerto appears to be a musical poem, variations on the main theme of the composition. Cello has always played a special role in Russian musical culture. a second voice, sort of an interlocutor and even alter ego of human voice. But it was Tchaikovsky in his Variations on a Rococo Theme (1876) who was able to bring together both chamber and virtuoso and concert aspects of the instrument. One should not be misled by the title of the composition. The theme belongs to Tchaikovsky himself but by its style is rather close to the music of Vienna classics, for instance, Joseph Haydn, or Wolfgang Amadeus Mozart. made by the author. But there's another one, Wilhelm Fitzenhagen version made with the blessing of Tchaikovsky. Wilhelm Fitzenhagen was an outstanding cellist to whom the composer dedicated his work and who first performed Tchaikovsky's Variations. This version has become very popular with the musicians. a one-movement piece that is developed in a "historical prospective". special place owing to its size and the scale of culmination. Nikolai Miaskovsky's Cello concerto is, by the spirit of its music, close to his late symphonic works and first of all to his Symphony No 21. Terrifying "Dramas of life" typical for his music of 1910s - 1920s give way to elegies where tragic episodes are presented more like reminiscences. only emphasizes a deep lyrical nature of the composition that the composer originally intended to name Concerto Poem. The Concerto is dedicated to an outstanding cellist Sviatoslav Knushevitsky who first performed it. Victor Simon was born in Moscow in 1930. He graduated from and did postgraduate studies at the Moscow Conservatoire under the tutorship of famous musicians R. Sapozhnikov, M. Jampolsky and S. Kozolupov. Prizewinner of international competitions in Prague (1950) and Berlin (1951). Since 1952 Simon has been working with the Tchaikovsky Symphony Orchestra, since 1961 – soloist and Principal Cello of the Orchestra. People’s Artist of Russia. Professor of the Moscow State Conservatoire. Many of his pupils work as soloists of leading orchestras not only in Russia but throughout the world. He made over 70 solo recordings for the radio fund and major recording companies. His discs include premiere performances of cello concertos by modern composers, music of all epochs and styles, from baroque to contemporary, including concertos by J.Haydn, L.Bokkerini, K.Saent-Saens, S.Barber, R.Schumann, N.Miaskovsky, B.Tchaikovsky, the anthology «Complete works for cello and orchestra by P.Tchaikovsky», Don Quixote by Richard Strauss and many, many other works.